btw congratulations on your great recovery! Good to see you back at home enjoying some good home made food. 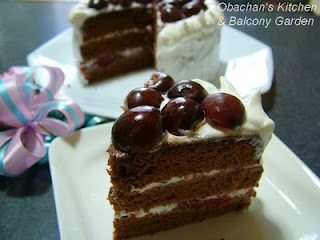 That Chocolate Cherry Cake looks magnificent and so elegant..... makes me hungry for cherries. Actually I was in the local store today, wondering whether there would be some cherries. :) Well enjoy! i'm glad to see you're recovered! i would slice the cherries to put between the layers, or try an upside-down cake. or, you could reduce the liquid in your cake batter, and then swirl in the sherry and cherries directly in, and frost and decorate the cake with one cherry on each slice. Like most Black Forest cake, they have the cherries sliced in half and put them between the layers. I understand that in Japan cherries cost a lot so it may seem a lot for you to use. But hey, indulge that sweet cake and enjoy! I love cherries, but “the more the merrier” approach can be a bit dangerous here… ;) Fruits are expensive here in Japan. Actually these imported cherries are less expensive. But these varieties grown in northern part of Japan are sooooo expensive! I guess it’s cherry season over there, too? Thanks for the tips. 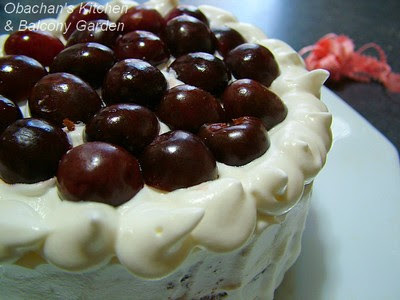 To tell you the truth, I chopped more than half of the cherries in small pieces and mixed with the cream and put between the cake layers. But it’s kinda hard to see in the photo, I guess. 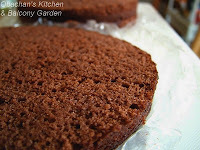 The white cream with dark red cherry bits showing between the dark brown cake layers… I just love it. 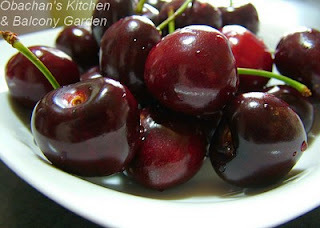 I chopped the cherries in small bits instead of slicing them. I thought it would make it easier when I cut the cake. Yeah, cherryness! :D I love that. Nevertheless, I would like to try a different decoration next time. Thanks for your comment. Can you email me at the address on the sidebar? If clicking on the "email me" link does not open a window, right-click on it and copy&paste my email address. TKS.